Well, the whole affair of applying self-tanning lotion is a bit time consuming. Hence, make sure that you have at least 2-3 hours in your hand. If you expect to finish the task by 45 to60 minutes, you are absolutely wrong. Rather, take your time and get ready for it. Choose a granular scrub that can exfoliate your skin gently. Getting rid of the uppermost dead cell layer will help you get an even tan throughout your body. A silky soft skin makes the process of self-tanning much easy. So, get rid of those unwanted hair prior to applying the lotion. It is important to take a bath right before going through a self-tanning procedure. However, you should use plain or lukewarm water for this purpose instead of too hot or too cold ones. A dry skin can lead to ugly splotches on your skin after the application of the self-tanning lotion. Therefore, it is recommended that you apply a tan moisturizer, especially on the ‘trouble areas’ like elbows, knees, feet, etc. The moisturizer will make your skin softer to facilitate the tanning. But you need to dry your skin off completely before starting the actual task. So, wait for some time so that the moisturizer gets absorbed by your skin totally. Some self-tanners can stain the hair strands badly. Therefore, you should apply a bit of chapstick or petroleum jelly to your eye brows as well as the hairline before starting the process. Always wear a pair of latex gloves so that your palms do not get colored. If you are skipping this step, make sure that you do not rub the tanning lotion on your skin for long time. 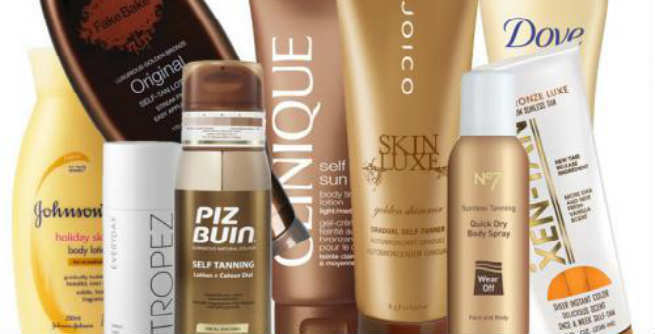 A uniform application of the tanner is highly necessary for getting a smooth, even tan. For this, you must rub the lotion gently with your fingers in circular motions. Start with applying the tanner on your face. It is the easiest part of the task. Then, follow by the neck and the ears. If you wish, you can make use of a Q-Tip and a small cotton ball for this purpose. Next comes your backside, which needs to be covered by the self-tanning lotion quite carefully. If applying the lotion onto your back becomes tough for you, opt for a spray one for this purpose. Finally, apply the self-tanning lotion to your arms and feet. However, it is recommended that you leave the areas like underarms, heels, toes and edges of feet as these do not get tanned usually. Now, make use of an alcohol-based toner and wipe off the splotches developed on your skin throughout the process. It will lighten the darker areas and give a smooth finish. Wait for at least 60 minutes before putting on clothes. Also, you should not bath or use any skin care product for minimum 8 hours.